From Goodreads: Magic has broken free all over the Twelve Kingdoms. The population is beset by shapeshifters and portents, landscapes that migrate, uncanny allies who are not quite human…and enemies eager to take advantage of the chaos. Dafne Maillouix is no adventurer – she’s a librarian. But the High Queen trusts Dafne’s ability with languages, her way of winnowing useful facts from a dusty scroll, and even more important, the subtlety and guile that three decades under the thumb of a tyrant taught her. This year, when selecting my choices to review for the RITA Reader Challenge, I made sure to choose books I actually own. I got this in one of many e-book sales, intrigued by the notion of a fantasy romance with a librarian heroine, not exactly something you see that often. It turns out that Dafne as well as being a devoted librarian and archivist is a scholar and a linguist, who delights in learning new languages. Her actual age is never mentioned, but it’s clear that she’s probably in her late thirties, possibly even early forties and has kept herself under the radar and voluntarily lived a sheltered life. She lost her entire family during the rule of the previous High King, a brutal and ruthless ruler, and feels the loss of siblings greatly. Now more or less acknowledged as an adopted sister to his daughter, the new High Queen (it’s clear that she usurped her father in previous books), she is unaccustomed to with any kind of affection. 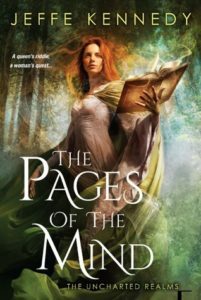 While this book is the first in a series called Uncharted Realms, it’s part of a world already established by Jeffe Kennedy, referencing events and characters from The Twelve Kingdoms, so this book is both a stand-alone and part of a bigger whole. The beginning of the the book felt a bit like I was missing out on something and made me wish I’d read at least the book about High Queen Ursula of the now Thirteen Kingdoms, but once Dafne leaves the court and goes off on her journey, the book was a lot more engaging. Share the post "A fantasy romance with a librarian heroine"